One of the great successes from our short time cataloguing at the Hurdy Gurdy has been our introduction of social media to provide information on the composition of the collection. The team who operate the Hurdy Gurdy, stalworths of hard work and knowledge, had already set up a Facebook page and created a website. With the addition of our Omeka catalogue we could highlight the collection as we updated the catalogue. 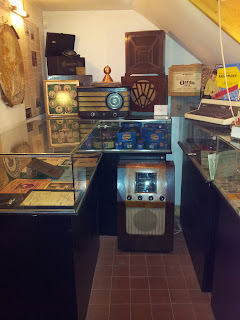 However, through a conversation one day at the Museum, it became apparent to us all, that Twitter was the modern communication equivalent of Marconi and De Forest. So we set up a Twitter account for the Hurdy Gurdy and began promoting the collection to as wide an audience as possible. Thus began our small effort to follow in the footsteps of the National Library of Ireland who have increased their audience engagement via Twitter and Flickr, by putting a more ‘human’ face on a national institution. Our initial strategy began with following people and organisations that were somehow associated with radio, history, and museums. Very quickly we received retweets, favourites and our steady band of ‘followers’ started to increase. 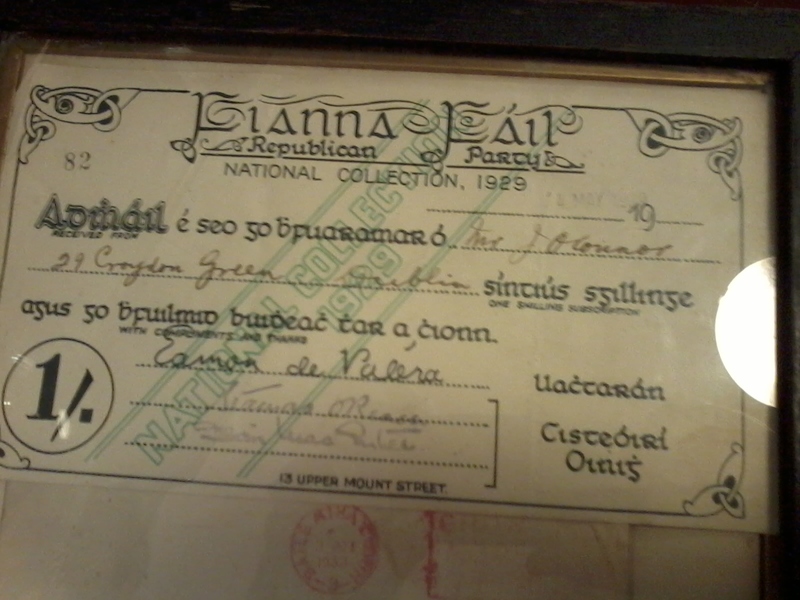 The weekend that we tweeted images of a receipt for the 1929 Fianna Fáil national collection we received a huge amount of interest. As Marie-Therese had set up Google analytics on our Omeka site, it was easy to calculate when our audience had been viewing the collection and what was of particular interest. This interest encouraged us in our efforts in highlighting the collection to as wide an audience as possible. 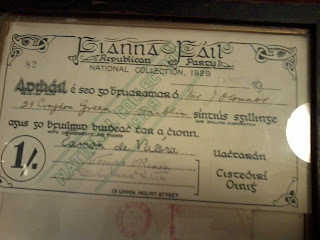 So we refocused our efforts on cataloguing the Irish ephemera within the Museum’s collection. As with everything concerning the operation of the catalogue and the metadata collection, this is a team effort, we both tweet and manage the Twitter interaction for the site, in between our day jobs. This is the real bonus of social media; we can manage to keep it all going because of how easy it is to connect with our audience via our smartphones, laptops, and tablets. Twitter has proved invaluable, as we’ve shared items from the collection with not only our Irish followers, but have engendered interest as far afield as Rio and the United States. Now on any given weekend, we can have visitors through the door from Japan, Luxembourg or the Ukraine. Twitter, Facebook, the website not to mention the Omeka catalogue enable us to spread our ‘Hurdy Gurdy’ net even further. We have regular conversations now with a follower in San Francisco who is Irish, broadcasting a radioshow of pre-1950’s recordings. These are connections we couldn’t have made via the normal avenues available to a small independent museum. 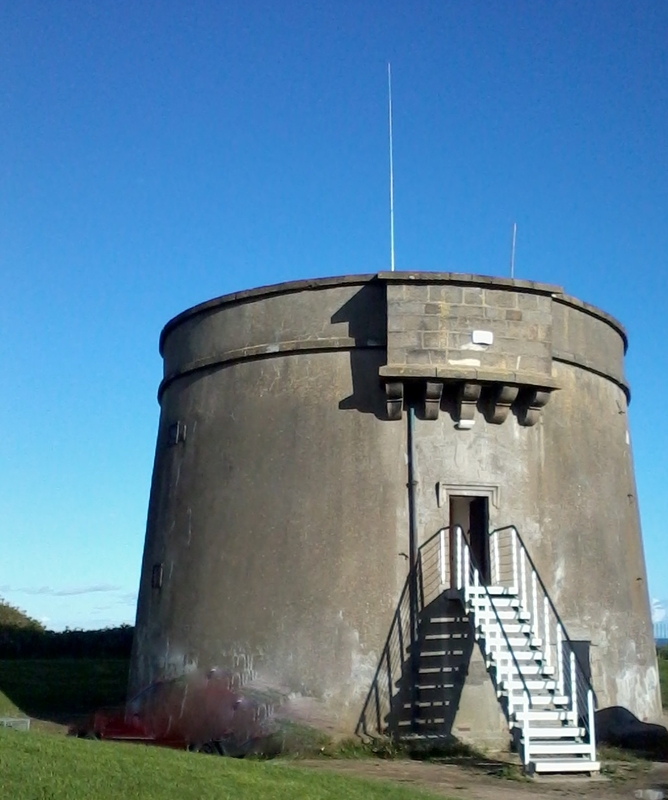 Overtime, we hope to increase the amount of interest in our collection, in the Martello Tower itself and in the history of communication within the island of Ireland. This hopefully will be achieved by our use of social media, our cataloguing of the vast collection and by the interest and engagement of our audience. There has been some interesting research published from an Irish LIS perspective of late. Below are a few of the articles I have come across recently. Apologies, if I have left anyone out; it is completely inadvertent! Send me a tweet @libfocus and I will add the reference to the list below. Please forgive the self-promotion by including my own also :). If anyone would like to contribute a guest blog post about recent, ongoing or future research, just get in touch with us at libfocusguestpost at gmail.com or through twitter. Hegarty, N. (2012) Breaking new ground: introducing special needs students to Waterford Institute of Technology (WIT) libraries. SCONUL Focus, 55(9). Lalor JG, Clarke M, Sheaf G. (2012) An evaluation of the effectiveness of information literacy training for undergraduate midwives to improve their ability to access evidence for practice. Nurse Educ Pract. 2012 Sep;12(5):269-72. doi: 10.1016/j.nepr.2012.06.005. Epub 2012 Jul 7. Regan J, Walshe M, Murphy A, McMahon BP, Coughlan T. Botulinum toxin for upper oesophageal sphincter dysfunction in neurological swallowing disorders (Protocol). Cochrane Database of Systematic Reviews 2012, Issue 7. Art. No. : CD009968. DOI: 10.1002/14651858.CD009968. 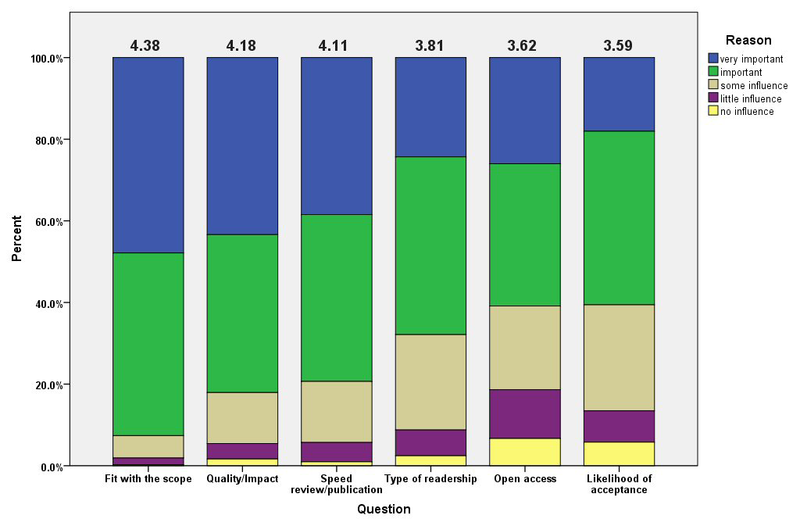 Dalton, M. (2012) Key Performance Indicators in Irish Hospital Libraries: Developing Outcome-Based Metrics to Support Advocacy and Service Delivery. Evidence Based Library and Information Practice, 7(4). On Thursday, November 22nd I attended the Mobile Technologies Symposium held jointly by LIR and AGI in the Davenport Hotel, Dublin. There were some really interesting talks on projects that have been implemented in a few universities as well as a few on making library content available in a mobile way. A couple of the presentations I didn’t find particularly relevant or interesting to be honest and one or two people could do with taking a cue from Louise Saults’ Prezi presentation which was by far the most appealing to look at presentation of the day. But rather than focusing on the negative I’d like to highlight a few of the talks which I found the most interesting and motivating. The videos of these talks are available to view here. Last year Maynooth introduced Kindle lending in the library. Louise Saults talked about the reasons behind their choice of using Kindles, how they set up the project and what kind of percentage borrowing they’ve had so far. The library decided on Kindles due to their size, ease of use and overall cost manageability. NUIM library initially purchased five but quickly increased this to ten altogether. Library staff were given the option of borrowing the Kindles in advance so that they would be familiar with the devices should students have any difficulties. The Kindles were uploaded with 22 free e-books at first, but this has now increased to 150 titles altogether. The Business and History departments in Maynooth took part in this pilot project and the books uploaded were relevant to those departments. The downsides to the project included the uploading process, which was time consuming as it had to be done wirelessly or by USB cable on each Kindle for each of the 150 titles. Also, as book publishers tend to restrict sharing of publications to between four and six Kindles in some cases it was necessary to purchase more than one copy of the title. It was of course necessary to de-register the Kindles once they were set up so that students could not buy books on the library account! Catalogue records had to be created for each Kindle and for each title on the Kindle, a 500 note was created to inform borrowers that the book was available on Kindle at the Information Desk. Louise then went into some practicalities of deciding on borrowing period (one week), fine for damage or loss (€100), and how they marketed the Kindles to library users (Facebook, Twitter, library website, in the relevant departments). In order to get feedback the borrowers were asked to fill in a survey when they returned the Kindle with a prize of a Kindle as incentive to complete it. Borrowers found them easy to use, to carry and were happy with the borrowing period. Overall the pilot was successful and has now been rolled out to include more departments for the current academic year. We’re going to run a feasibility study on whether our library could do something similar, possibly next year. Samantha Drennan and Joshua Clark talked about creating a mobile version of the library website and what they decided to include and exclude from this version. They decided to have “need to know information” on the mobile website. This allows students to browse the library catalogue, lets them log in to their account, get branch information and opening hours, etc. It’s simple to use and loads quickly on a mobile browser even when limited to 3G. 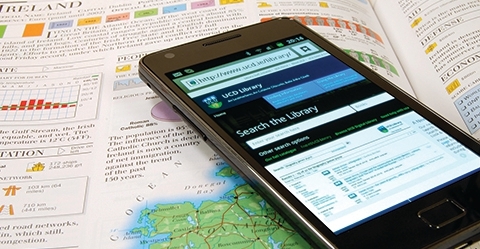 In the academic year 2011 to 2012 only 1.8% of page views to the UCD library website were by mobile devices. In October 2012 this had risen to 3.7%. The information students tend to be viewing on their mobiles is essential library information rather than looking to search databases. But there is still a question over how necessary a mobile website is and how much of an impact mobile users are making on library website usage. I really enjoyed this talk as I think it was an interesting idea to try and encourage getting people into the library more. Andrew Walsh spoke about a study they did in Huddersfield to see if library usage by students had an impact on their final grade. They found that there was a correlation between use of e-resources, book borrowing and student attainment. But there was no correlation between visiting the library and student attainment and the librarians at the University of Huddersfield wanted to try and change that, and so began the Lemontree project. 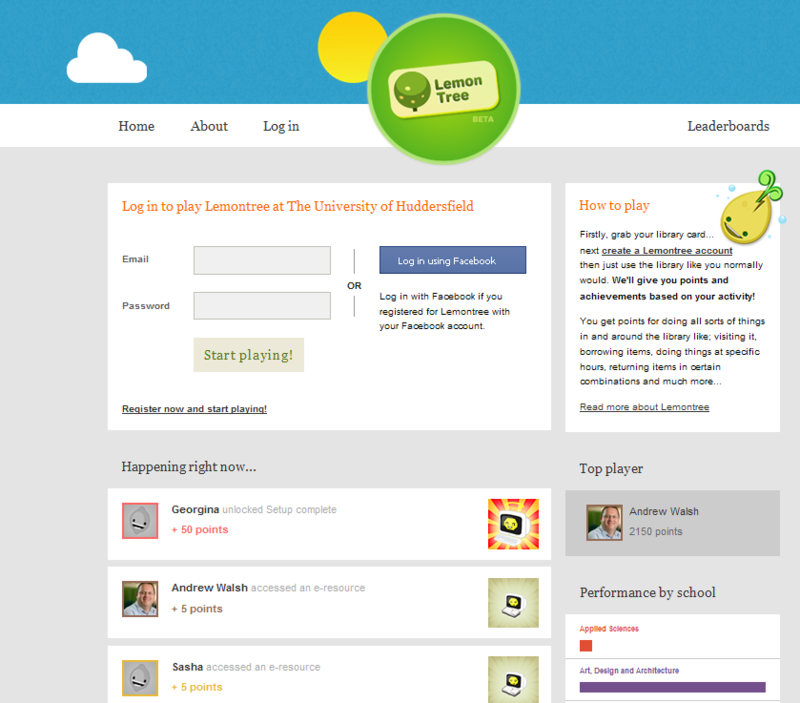 Lemontree is quite like those games on Facebook where you carry out tasks and gain trophies or as is the case with Lemontree, badges. Students register once and it links to their library card. They don’t need to sign in again after this. They can also link to their Twitter or Facebook accounts and it will post their achievements to these. The game automatically gathers information about the students’ library activities. So when they borrow or return books, write reviews, log in to use e-resources, visit the library, etc. they will receive points. There are different badges and levels and the more points accrued the higher the level and the more your lemon tree grows. The game is proving quite popular so far. Students have been talking about it on Facebook and Twitter and seem to be using it. It’s still too early to find out if this will, in the long run, affect student attainment, but this will be the next part of the project to study. Niamh Tumelty has recently started a new Information Literacy Journal Club. Sheila Webber has set up a blog for the project, and the first article will be selected shortly. In the meantime you can join in with the #ILread hashtag on Twitter or join the Zotero group (see the blog for further details). I'm looking forward to posting my thoughts on the articles on libfocus. Many thanks to Niamh & Sheila for setting this up! Discovery Platforms in Special Libraries - Do We Need Them? In recent years, libraries have been actively pursuing the 'single search box' philosophy to attract patrons used to the minimalism of Google's interface and to simplify the process of searching for scholarly content and resources. Publishing and database companies have happily obliged by providing a range of different products and technologies including Ebsco's Discovery Service, Primo and Summon from Serials Solutions. However, if users are already comfortable using Google's interface as an access point, do we really need to devote time and money to institution-specific consolidated indexes and discovery layers? Aaron Tay discusses the key arguments in the discovery debate. 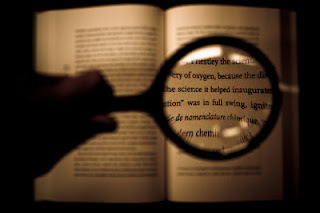 In the academic setting, I think there are certainly some arguments for discovery layers and interfaces to help undergraduates get to grips with searching for scholarly content. However, even this is not clearcut. Tay quotes evidence from the University of Illinois who found that "users of their Ezsearch (a very impressive advanced federated search system that is for all intents and purposes on par with Summon and services in its class), did known item searches for almost half of all searches (49.4%)". Whilst searching for a known article will 'generally' work well using such interfaces, this is obviously not what these services are primarily designed for. Indeed, this same trend prompted Utrecht University Library to shift their focus to delivering content rather than discovery (Thinking the Unthinkable, a Library without a Catalogue; see also the video), and not because they do not not have the capability (they built their own in-house platform over ten years ago). Moreover, without filtering or narrowing the sources appropriately (arguably defeating part of the one click advantage of these platforms), users may be overwhelmed and frustrated by a large volume of news articles and other content which may be useful to a journalism student for example, but not so helpful for a medical student. Notwithstanding these issues, discovery services are now commonplace in the academic library setting. However, more recently I have also seen these platforms being implemented in special libraries, and I am not so sure about their real value in this context. From my own experiences as a medical librarian, the majority of searches undertaken by users require relatively complex search strategies rather than simply basic keyword searching; the use of MeSH and EMTREE terms are pretty much essential because of the need for searches to be systematic and comprehensive. No doubt a similar level of detail is required in other special library contexts, such as law libraries. However, discovery platforms often don't include all of the rich metadata from the original source in the central index that underlies the discovery layer. Furthermore, some databases and resources are not yet included in any of the commercial products currently available. This in itself causes confusion for users - which databases are included in the index and which resources are not? They may think using the discovery interface searches everything (like Google apparently does! ), thereby omitting useful additional sources. Many clinical staff and health-care workers still use PubMed as their default access point for the majority of primary research, and introducing a discovery platform would probably not change this. But do we even want it to? Replacing a freely available source with a subscription one is questionable. When staff move to another hospital (or indeed when most students leave University) they may have to switch back to sources such as PubMed and Google Scholar anyway. Right now, I don't see any great value in implementing discovery services within a health sciences library, in fact they may even do more harm than good in the long run. After all, are we just trying to help our users find information during a four-year degree or an employment contract, or for the rest of their lives? I've been doing some research into Radio Frequency Identification (RFID) and whether it can assist the small library in meeting the challenges of everyday operation. Investigating whether self-service machines with RFID can assist small teams - and does it increase security? We are in a period of increasingly tight or non-existent budgets, and decreasing staff numbers, but we also face increased patron demands coupled with requests for extended opening hours. So in order to ensure an effective service delivery, do we seek a technical solution? CILIP recently ran another one day conference on the use of RFID within libraries, (the eighth that it has held). I've found the available presentations and the subsequent blogs and tweets from the conference helpful in working through the issues around RFID. 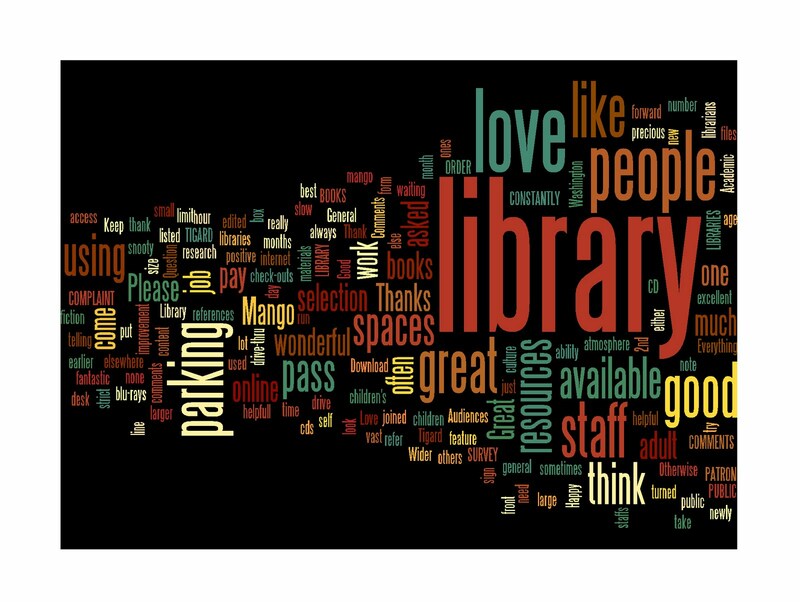 Reading through the relevant literature is one thing, but the 'real world' feedback from the information professionals and librarians who are already working with and utilising RFID, is a little bit more enlightening. So where does all this pondering leave me? I welcome technology that assists our role and provides added value, whilst enhancing patron experience. I've been seeking a solution that incorporates RFID within a self-service kiosk that includes payment of fines, a one-stop-library-shop so to speak. Thankfully, our profession is one that encourages the use and implementation of technology to augment our service delivery. If only we had limitless budgets to fund all our ideas to enhance our patrons experience. Last week Trev and I attended an instructive seminar on emergency response management for archives, records, libraries and museums hosted by Harwell*. Some sensible and very practical advice was given on how to optimally prepare for the ghastly spectre of a smoked out and/or flooded library. Take a look at this stream of images, captured by Jim Miles of the University at Buffalo Law Library. 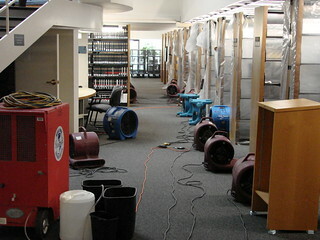 They very much illustrate what sort of damage a flooding incident can do to your library and information service. Calamities of all proportions were discussed, which I’m sure cross your mind every now and then but never really come to the forefront until disaster strikes. Chaos, operational downtime and the possible (irreversible?) loss of library resources can be contained if you arrive on the scene prepared. Being prepared means to kick-start a well-thought through set of appropriate countermeasures. Instantly. Without delay. Time is of the essence: recover everything wet within 72 hours. We were walked through various flooding/fire examples and the specific responses to each of these incidents. Of primary concern was the importance of implementing an optimal recovery strategy that meets the specific demands of your collection context. This includes appropriate handling procedures, avoidance of secondary damage and the action of effective salvage strategies. Health and safety issues were also discussed (e.g. the risks of foul-water flooding, mould growth and generally hazardous environments). Check out the full presentation for detailed information. 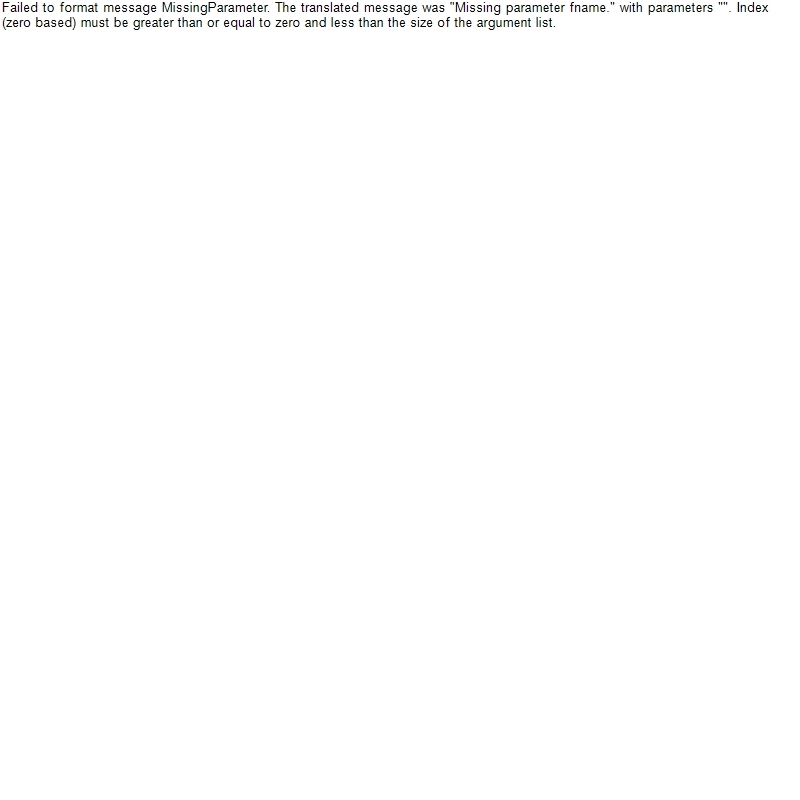 Harwell also kindly provided us with a template disaster plan (long version vs. short version). *Disclaimer: the above piece does not constitute a commercial endorsement of Harwell. Marketing is now an essential aspect of library management, but communicating your value to customers achieves very little if you don't create conversions. Cross-selling (think of McDonalds and their "Would you like fries with that?" 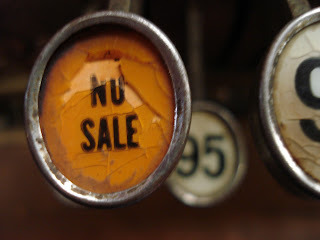 tagline) and up-selling (getting a customer to upgrade to a higher value product) are two classic sales techniques that are frequently used to great effect in retail. This idea may seem a little clinical to those working outside the corporate environment, but the basic principles behind these sales strategies - encouraging your customers to use more of your products or to try higher value services - are common objectives for many of us. Marion Ryan from the Entrepreneur Soul blog believes "The key is to think of upselling as additional benefits and better ways to serve the client". Additional benefits for customers? Better ways to serve your users? Sounds like a good thing to me. Marketing in libraries should be all about benefits. 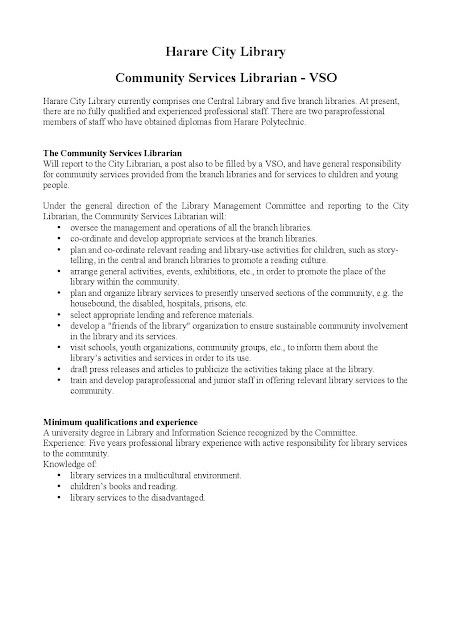 Most libraries and librarians talk about their services; what they offer; the comprehensive list of their resources. But many users (and perhaps more importantly, non-users) will not connect with this; this information is meaningless to them unless they can immediately see 'what's in it for me?'. So stop talking about yourself and start thinking about your users (this is not the same as thinking that you are thinking about you users, you have to really do it!). In fact, cross-selling and up-selling are the easiest opportunities you will get to promote your services as you already have a captive audience (library cold-calling anyone? ), so why don't we take advantage of this? If we only focus on the user's short-term query or need (which is obviously still of primary importance), we miss the moment that can turn good customer service into great customer service. Instead, by offering personalised expertise we can deliver a service that maximises our value to our users, creating loyalty, engagement and trust. So how can we use cross-selling and up-selling effectively in practice? It requires being proactive, taking an interest in your users' broader needs and time. At a busy reference desk the latter is often in short supply, but more often than not, investing a little extra time reaps dividends in the long-run. The most important thing to remember is that it must bring a direct, relevant benefit to your user, otherwise you will be wasting their time, and risk turning a positive experience into a negative one. With a little creativity, a routine transaction such as a student enquiring how to find resources on medical ethics can provide the perfect opportunity for cross-selling an information literacy workshop. A researcher trying to track down a conference paper can be easily up-sold to a broader suite of research support services. In the public library setting, a reader borrowing a copy of Norwegian Wood presents a great chance to cross-sell the DVD or even to up-sell the monthly bookclub. These are just a few of the ways that a single interaction can be turned into a longer-term relationship by actively promoting your services as solutions that your users need, even if they don't know it yet. A paper published in the current issue of the Journal of the American Society for Information Science and Technology (paywall, sorry :( ) estimates that the proportion of highly cited papers published in high impact journals has declined substantially in recent decades. In 1990 45% of the most cited 5% of papers were published in the top 5% of journals ranked by impact factor; by 2009 the proportion had dropped to 36% - representing a 20% fall in market share in 20 years. This is partly due to the growth in the number of publication outlets generally over the period, however it still appears a high impact factor is no longer the sine qua non it once was. In my view, this is just the beginning. The increased use of altmetrics has already shown that tweets, bookmarks and other social sharing tools can have a substantial impact in disseminating research quickly. However, channels like these only represent the tip of the iceberg when it comes to promoting research. Whilst twenty years ago getting your paper into a high impact title like Nature or Science was enough to ensure it would be widely read, in today's competitive research environment it counts for a lot less. Now, research promotion is almost as import as research itself. The video below is an excellent example of this idea. This short film essentially functions as a 'trailer' to promote a research paper by Cross & Wheatland (the YouTube URL links to the pre-print), and with over one million views to date is a simple but effective example of how creativity and promotion can increase research visibility - and potentially impact. This doesn't mean that every author should start making videos to accompany their journal articles, but it does provide an opportunity for libraries to position themselves as research promoters as part of their overall research support package. This is an area where libraries can provide a real value-added service to researchers - leveraging their existing expertise and networks to help package, distribute and promote research. In most cases, libraries are already doing this on a lesser scale e.g. through open access initiatives, promoting institutional respositories and advising on bibliometrics. However the benefits from ramping up these efforts into a more co-ordinated and creative package, including aspects like SEO and social-media, are potentially significant. As Brian Mathews argues in this article in the Chronicle: "It’s no longer about just publishing a paper but creating a suitable outlet and campaign to share the findings. Our [librarians'] job becomes producers: designing and developing the channels, methods, processes and metrics to repackage content (academic papers) into formats apt for expanding the audience". The LAI Career Development Group (@laicdgroup) have a new online home at http://laicdg.wordpress.com. I often think about what it would have been like to try to embark on a career in librarianship in the olden days. And by olden days I of course mean that dark time before the internet existed. What really blows my mind is how easily we can now communicate, not only with that tiny handful of people we know, but with the great sea of the world’s librarians. And librarians are such nice people. They will surely help you out, if you just ask politely. 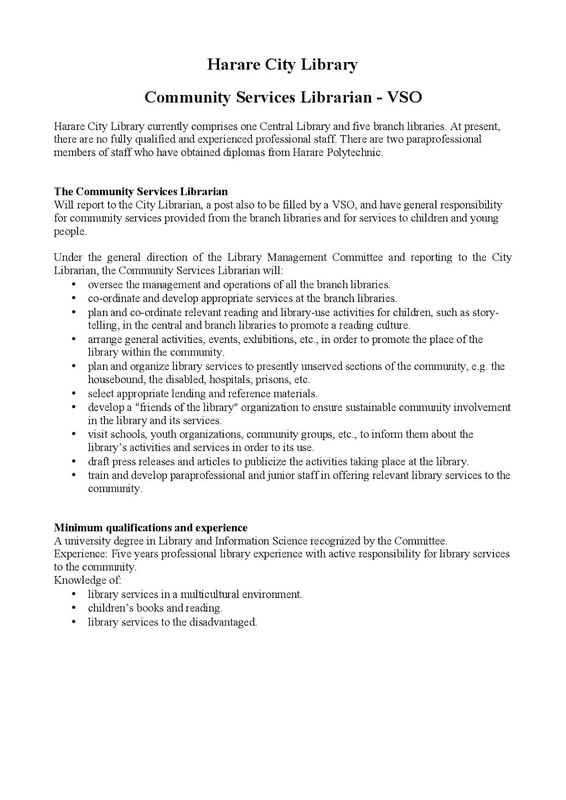 I started the blog Hiring Librarians at the end of February 2012. I was about four months in to my own frustrating and demoralizing job hunt. I was mystified by the strange rituals of library hiring – the inscrutable government lists for public library employment, the enigmatic rituals of academic processes, and the lack of even a hint as to where to find special library jobs. I wanted work, but I didn’t know how to get it. So I started asking people who hired librarians to answer some basic questions for me. I started by emailing a few people from my own tiny pool of library contacts, posting their responses to a short, online survey. Then I sent out requests to listservs such as PUBLIB, collib-I, AUTOCAT, LIBREF-L, LM NET and ILI. Only one of these refused to let me post (telling me that it was off-topic). I made it really easy for people to respond to my questions, and I didn’t require anyone to leave a name. But some did! And then when readers brought up questions that hadn’t been included in the initial survey, some of those non-anonymous people agreed to answer them, and this is how the Further Questions feature got started. I also started to send out emails to individuals. Both Barbara Stripling and Gina Millsap, who were running for ALA president, responded. I also was able to “interview” some employers with open positions, at the request of readers who were applying. The innovative AnyThink library was one such respondent. I also found and contacted people via Twitter. Librarians love Twitter. 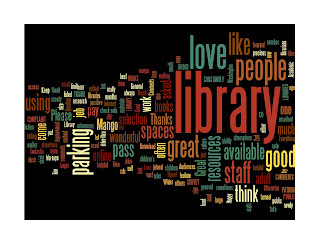 Megan Hodge and Nicole Spoor emailed me because their own research focused on library hiring, and then were gracious enough to write a guest post describing their findings. 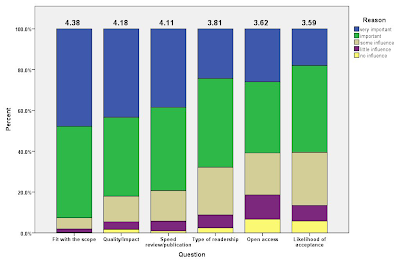 Since then I have been able to include guest posts by other researchers and authors, such as Priscilla K. Shontz and Rich Murray, who wrote What Do Employers Want? A Guide for Library Science Students and run the blog LIScareer. I am amazed by the number of people who have been willing to take time to contribute to this project. As of November 12th, 2012, 161 people have responded to the original survey and 235 have responded to a second survey about interview clothes, created in collaboration with Jill of the blog Librarian Hire Fashion. 25 people let me email them hiring questions on a weekly basis. And I’ve been able to work with several other researchers, bloggers, and authors on guest posts, either for my blog, or for theirs, as I am doing here on LibFocus. None of this has happened face to face, or even over the phone (with the exception of one individual). I only met a few readers in person just recently, when I attended my first library conference. Could I ever have worked with this number of people, from all over the globe, without the glorious internet? Can you imagine carrying this on via written correspondence? I could not have created and distributed my survey without Google Apps, and I certainly couldn’t deliver transcribed content daily without my best friends, copy and paste. Last January I registered for Codeacademy brimming with good intentions and motivation. The first few weeks I was a model student, but after a month or so I started missing the weekly deadlines due to work and other commitments, and shortly afterwards I gave up completely. It wasn’t a conscious decision, but once I fell behind by a couple of weeks it was all too easy to forget about it altogether (I am still getting the weekly reminder emails, which are a constant source of guilt!). I also signed up for a Coursera course (Computing for Data Analysis) a few months ago, thinking a shorter time frame may be more manageable, but unfortunately the programme commenced at a very busy period for me and I never seemed to find the time to even get started with it. I did make it through Google’s recent Power Searching MOOC (I was primarily interested in seeing what Google view as the key issues and skills), though I admit it was a struggle, and in some cases I played the videos in the background whilst doing other things. Maybe online learning is just not for me? 50,000 students is in some ways easier than 50 students. Clarity and specificity are necessary. Peng will also be running the course through his Simply Statistics blog shortly. It will be interesting to compare the feedback and experiences of users across both platforms (read the comments accompanying Peng’s post for feedback from the Coursera participants). I don’t believe that truly effective online teaching can ever be a case of simply videoing a face-to-face lecture and uploading it to YouTube, even though I have experienced several examples of this in the past. To do so, is largely missing the point; even if the 'content' needs to be broadly the same, it requires very different packaging. 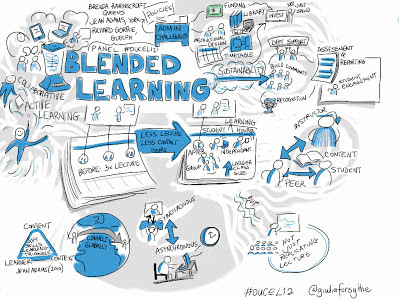 In the same way that active learning strategies are so valuable in the classroom, interaction and participation is just as important (if not more so) with online and asynchronous learning. My own lack of success to date as an online student may partly be due to time pressures, but I am a great believer that if something is important enough you will make the time. Maybe I just wasn’t passionate enough about the topic to really push myself to see it through? But surely one of the characteristics of good instructional design involves stimulating interest and encouraging engagement (within reason)? I also get discouraged easily when faced with the prospect of lengthy presentations and videos – in this respect I think Peng’s comments about modularity are key. Personally, I am far more engaged as a learner when presented with a menu of resources each covering a single concept or idea, rather than a single longer presentation. With the former I can select the relevant content I need, achieving an immediate pay-off that motivates me to continue. I can essentially tailor the content specifically to my personal learning needs even within the infrastructure of a generic programme or module. Conversely, with the latter my interest quickly tapers off when presented with less relevant material or aspects I'm already familiar. 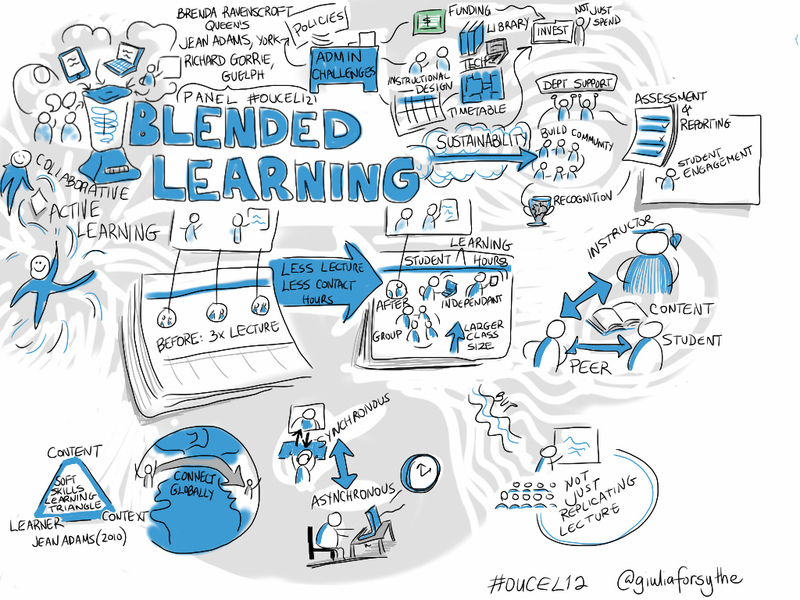 Most recently, I have registered for a Coursera module on Elearning and Digital Cultures starting in January 2013. A pre-course email circulated this week recommends that participants should use a blog to record and share their learning, so depending on my success this time around, you may see my own reflections on the Coursera experience here in the near future. Ireland getting you down? Fancy moving to a country with one of the best climates in the world and helping to get a new generation of Zimbabweans back into their libraries? Here in Harare there is a grassroots movement underway to renew our city libraries. Harare City Libraries consist of the main library on Rotten Row in the city centre and 5 other suburban branches. Efforts this year have seen reading and storytelling session carried out by volunteers to encourage our next generation of readers to make use of this important community resource and to bolster membership of our libraries. The city of Harare libraries is also hard at work sourcing new books to renew the collection and to raise funds for essential repairs to the libraries, in particular the main library. This was established in 1902 as the Queen Victoria Memorial Library, celebrates an important anniversary in 2012. This year, the award winning building to which the library moved in 1962, turns 50. When it was completed, the building was awarded a medal by the Royal Institute of British Architects as one of the best designed buildings in Southern Africa during the period between 1948 and 1962. This is one of only three Bronze medals ever awarded in the whole of Africa. Sadly over the last 10 years the library has fallen into a state of disrepair. Many thousands of people have used the library facilities. A generation of Zimbabweans fondly remember Saturday mornings sitting in the light and airy building as they benefitted from reading the library’s huge collection of books. Our aim is to create these seem memories for a new generation of Zimbabweans and this is your opportunity to be part of this important and exciting initiative! 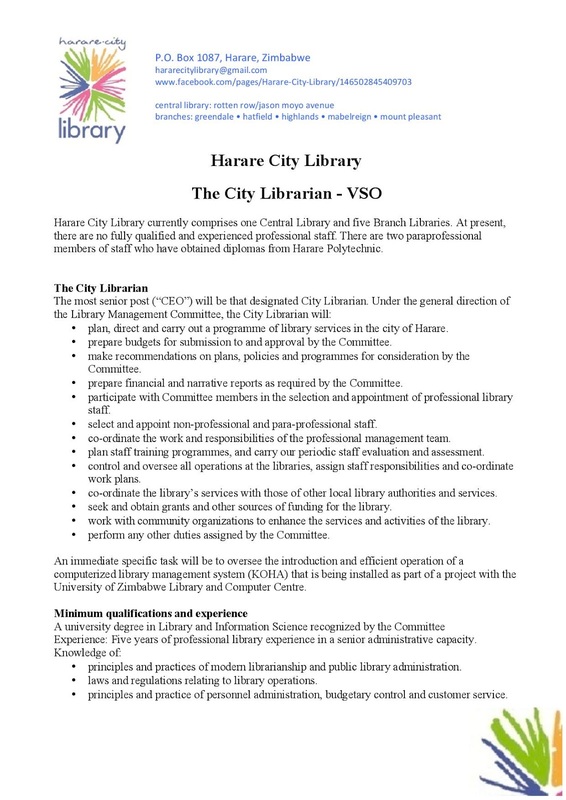 Through Voluntary Services Overseas (VSO) we are looking for a senior librarian and a community librarian who can work with us to restore the City of Harare Libraries to their former glory! At present, there are two paraprofessional members of staff who have obtained diplomas from Harare Polytechnic however there are no fully qualified and experienced professional staff. We’d like you to remedy that!! If this sounds like something that you might be interested, please get in touch with either Deirdre Ní Cheallaigh dnicheallaigh@trocairezw.org or Katrina Wallace-Karenga Katrina@yoafrica.com for more information about the two posts. …is a discovery tool that explicitly targets the learning and education audience out there. I played around with it and surely feel that it represents a very effective alternative to using well-worn mainstream search engines when it comes to finding out about things and conducting topical research. instaGrok uses an interactive mind-map that displays concepts based on any given subject you’re interested in. Enter a subject term (keyword or a short phrase) that is of interest to you, and suggested concepts are retrieved that link to related resources. It is possible from the outset to adjust the level of detail when running this (any) search (see slide at the top). Each concept node links to various other nodes and relevant resources (look out for key facts, websites, images and glossary etc. on the right hand side). You can plot a conceptual route by pinning down nodes as part of the discovery process, whilst at the same time removing nodes that you’re not so much interested in. This can be a very useful filter mechanism when conducting research on a narrowly defined topic. A search history keeps tabs on the subjects of interest that you looked at previously. You can play with instaGrok without creating an account, but you might as well do just that in order to sample its very useful core features, namely the customising of concept maps, keeping a search history and creating a personal journal. The study journal function is really quite handy as it enables you to document your research results for later use in a new information context (say you're adding stuff from readings that you took off the bookshelf in the library). The journal is quickly populated as you can freely note down ideas around nodes and pin related key facts, videos and images and then email the same to yourself. What I like most about instaGrok is that it utilises crowd sourcing for the purpose of selecting and rating recommended information resources. To sum it up here, instaGrok is an intuitively to use search engine that lends itself as a good starting point for pulling in Web resources (and conceptually map them), that will enable you to quickly answer more complex questions.